When an ear infection strikes man's best friend, there will be some distinctive symptoms that cannot be ignored. 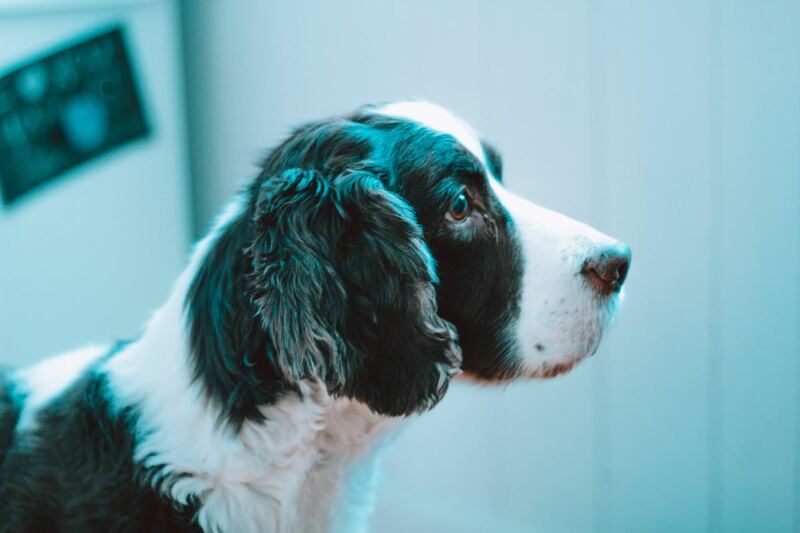 An ear infection, indeed, may be so annoying to deal with that it is not unusual for dog owners to promptly schedule a vet appointment just to spare their canine companion from another miserable day. While an ear infection may be bacterial, viral, or due to the presence of yeast or ear mites, the series of symptoms are always the same. Ear infections in dogs may affect the outer ear canal (otitis externa) or the inner middle ear (otitits media). Infections affecting the outer canal are generally less severe than the infections affecting the middle ear. However, left untreated outer ear canal infections may spread to the middle ear, creating complications. Following are signs of both types of ear infections in dogs. 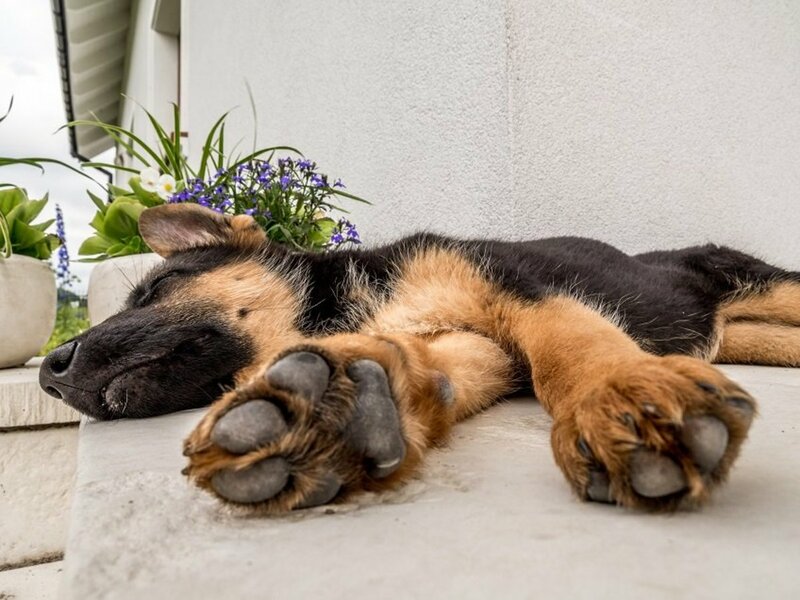 Dogs affected by ear infections tend to feel discomfort in their ears and may therefore scratch and paw at their ears. In some cases, dogs may even rub their ears against furniture or the floor. Many times, the scratching may be continuous, becoming quite frustrating to watch. This may lead to tissue damage and a complication known as ''aural hematoma''. Ear infections are quite painful and often dogs will exhibit a distinctive head tilt. This is done in an effort to try to remove from their ears something that is bothering them. In some cases, there may be something trapped in the dog's ears (like a fox tail) however, this is a typical symptom of ear infection. 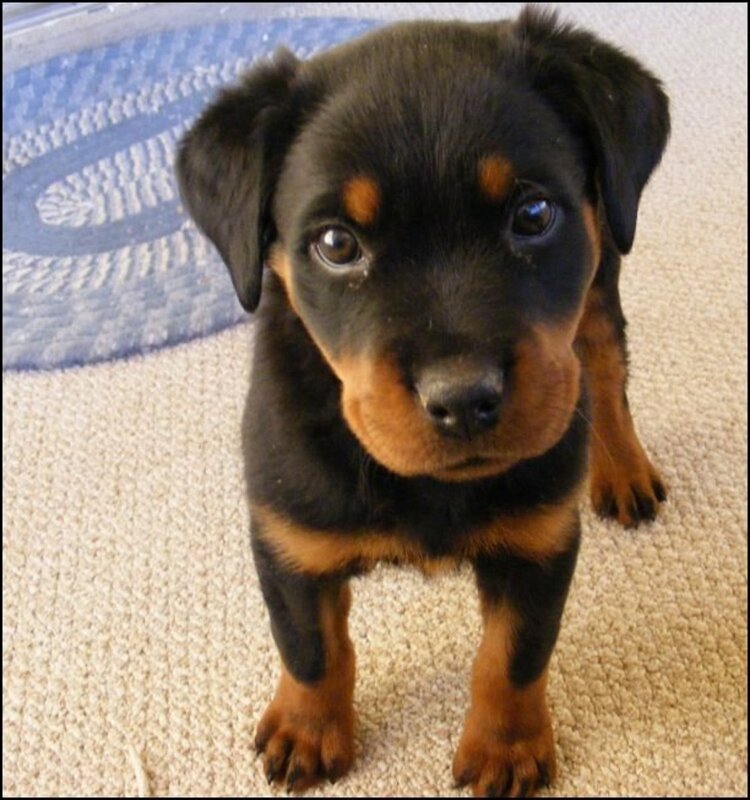 In some cases, the dog's ears when affected by an ear infection will assume quite an unpleasant odor. This may be due to a bacterial or yeast infection. This odor should go away once treatment has started. Infected ears may also produce a higher than normal discharge. The discharge may appear dark, resembling coffee grounds when affected by ear mites,or may be yellowish brown. The discharge is the ear's way of protecting itself and attempting to get rid of the foreign invader. As mentioned earlier, the constant head shaking and scratching may cause visible swelling of the ear flap. 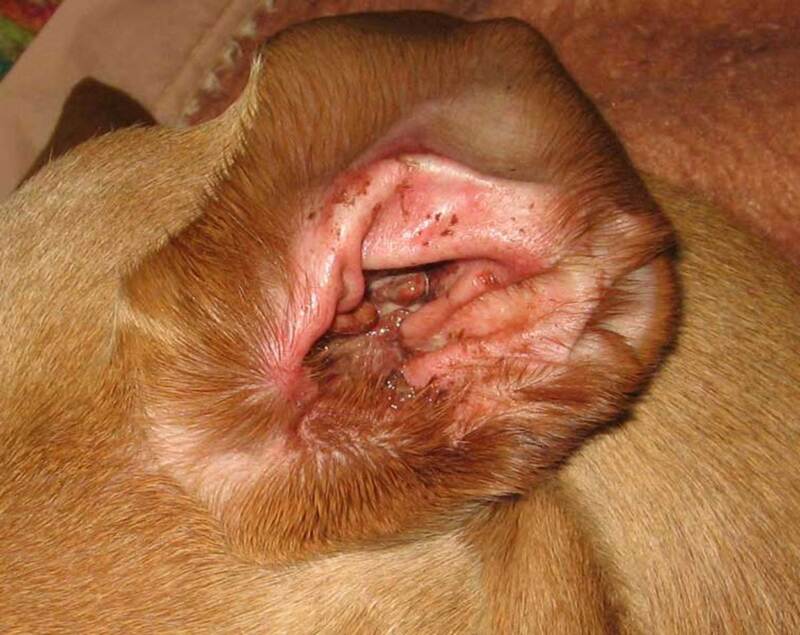 This complication is known as aural hematoma and it is caused by bleeding from the ear's blood vessels which fills up the dog's ear flaps making them look like big marshmallows. 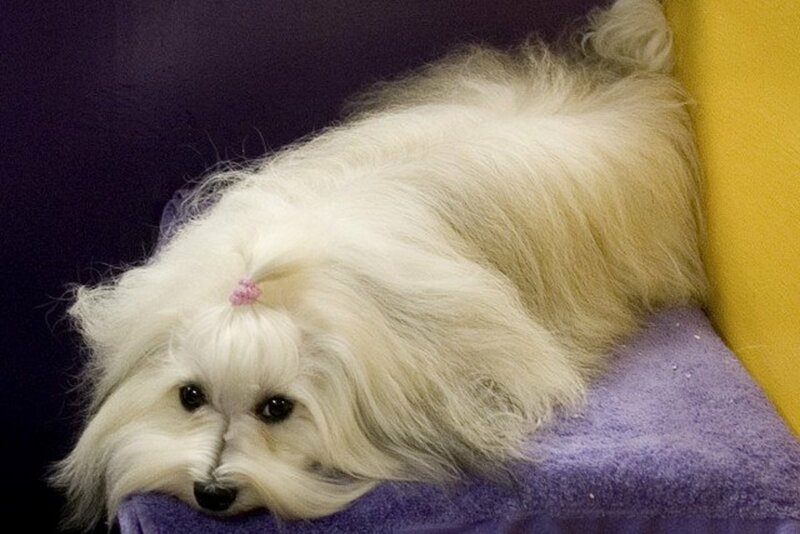 When the middle ear is affected, dogs may exhibit signs of vestibular disease. Such signs include lack of coordination, dizziness, back and forth eye movements, circling and falling to one side. Such symptoms are often confused for a stroke. Middle ear infection can be a complication of dogs with a history of recurrent and untreated ear infections. Most cases of ear infections will go away with ear drops and a round of antibiotics. 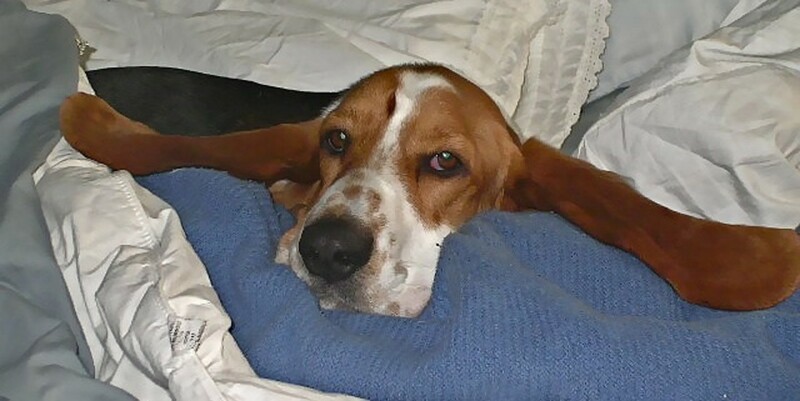 However, some dogs may be prone to repeated ear infections such as dogs with droopy ears like Cocker Spaniels or Basset Hounds. Ear cleaning, the use of cotton balls when bathing and a thorough inspection of the ears is key to keeping this problem at bay. Why Does My Dog's Ear Infection Keep Coming Back? My dog just loss his appetite these few days. Yesterday night I found out that his left ear got red and there's a brown lump or particle in it. Is that ear infection? After his bath I use ear gel to remove his stubborn stain in his ear and I assume I clean it too hard and hurt his ear. Please help! What can I do? thank you, he makes the hub on dog ear infections look nice! Great article, when my dog starts scrating her ears I know it is time to pull those hairs out. Or she will get an infection. Thank you so much for loving the wonderful children.